The Pentax Optio W60 is a compact, lightweight, fully waterproof digital camera featuring 10 megapixels, a 5x optical wide angle zoom lens (28 – 140mm equivalent), and a 2.5 inch high resolution LCD monitor. The Optio W60 can operate underwater up to 13 feet (4 metres) for as long as two hours and in temperatures as cold as 14 degrees Fahrenheit (minus 10 degrees Celsius). Waterproofed to the JIS Class 8 standard, the camera is dustproof to JIS Class 5 against sand and dust. This makes it an ideal choice for outdoor winter activities such as skiing as well as for water sports including boating, fishing, kayaking, snorkelling. The Pentax W60 also features Face Recognition function, 7 auto picture modes, HDTV movie capture capabilities, ISO up to 6400 and 36 megabytes of internal memory. The Optio W60 is available in a choice of two colours: ocean blue and silver. 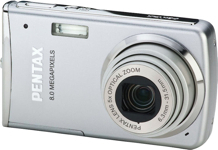 GOLDEN, CO — May 22, 2008 — PENTAX Imaging Company has announced the PENTAX Optio W60 compact digital camera. Lightweight and fully waterproof, the Optio W60 features 10 megapixels and a 5X zoom lens with 28mm wide-angle capability. The enhanced design of the Optio W60 allows the camera to operate up to 13 feet underwater for two hours and at extreme temperatures well below freezing. Perfect for photography in adventurous as well as everyday settings, the 5X optical zoom refraction lens never protrudes from the Optio W60, yet it covers focal lengths from 5mm to 25mm (approximately 28mm to 140mm in 35mm format). This range allows the camera to capture a wide variety of scenes including expansive landscapes, architecture, and group photos in confined spaces as well as close-up telephoto shots of subjects. A Digital Wide function merges two shots into one image for ultra-wide-angle image capture (equivalent to a focal length of 21mm in 35mm format). The Optio W60 also accompanies users to new aquatic depths. With improved design and construction of the shutter button and controls, as well as reinforced, airtight joints, the Optio W60 allows underwater photography up to 30 percent deeper than previous PENTAX waterproof models. In addition to the JIS Class 8 waterproofing standard, the camera is JIS Class 5 dustproof against dirt, sand and dust and operates in extreme temperatures as cold as 14 degrees Fahrenheit (minus 10 degrees Celsius). Other important features and modes of the PENTAX Optio W60 include a High-Quality Movie mode with HD resolution up to 1280 x 720 pixels (comparable to a 720p HDTV at 15fps) as well as Auto Picture mode, fast Face Recognition, Smile Capture, Blink Detection, an Underwater Movie mode, High Sensitivity Digital SR mode that automatically adjusts the sensitivity up to ISO 6400, and an LCD monitor with a 170 degree wide-angle view and Anti-Reflection coating to reduce glare. A perfect companion for indoor and outdoor enthusiasts, the PENTAX Optio W60 performs well during winter and summer activities as well as in and around water and sand. 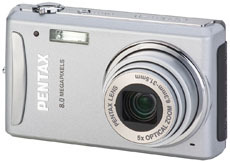 The PENTAX Optio W60 will be available in July 2008 for US $329.95 in a choice of two colors: Ocean Blue and Silver. With 10 effective megapixels, the PENTAX Optio W60 delivers highly detailed photos. The PENTAX Optio W60 features an internal 5X zoom lens that covers focal lengths from 5mm to 25mm (approximately 28mm to 140mm in 35mm format) and a refraction lens that never protrudes from the camera while zooming. This system allows the camera to capture a variety of scenes including expansive landscapes, architecture, and group photos in confined spaces as well as close-up telephoto shots of subjects. When combined with the intelligent digital zoom function (up to 5.7X) zoom magnification may be increased to 28.5X. The Optio W60 operates underwater up to 13 feet (four meters) for up to two hours, which is an increase of 30 percent over the performance of previous PENTAX models that were limited to 10 feet. This performance is the result of improved construction of the shutter button and other controls and reinforced, airtight external joints. Waterproofed to the JIS Class 8 standard, the camera is dustproof to JIS Class 5 against sand and dust and operates in temperatures as cold as 14 degrees Fahrenheit (minus 10 degrees Celsius). This makes it a perfect choice for outdoor winter activities such as skiing as well as for water sports including boating, fishing, kayaking, snorkeling, etc. The 2.5 inch high-resolution (approximately 230,000 dots) LCD monitor features an Anti-Reflection coating to reduce reflective glare and be easily viewed even in bright sunlight. The monitor’s wide viewing angle (about 170 degrees both horizontally and vertically) allows users to view images from nearly any angle. The Optio W60 captures movies at resolutions as high as 1280 x 720 pixels, which is comparable to HDTV resolution at 720p (15 fps). The camera also features Movie Shake Reduction to automatically correct camera shake and an Underwater Movie mode that optimizes color settings for recording underwater. Featuring scene-recognition technology, the camera’s Auto Picture mode determines the subject’s shooting conditions and automatically selects the optimal scene mode. Optio W60 photographers also may select from seven capture modes including Flower, Sport, Night Scene Portrait, Landscape, Portrait, Night Scene, and Standard modes. Face Recognition AF & AE function on the Optio W60 delivers beautiful portrait shots with a single setting. This convenient function automatically sets the focus and exposure detecting up to 32 faces at one time in 0.03 seconds. The camera also features Smile Capture mode that automatically captures images when subjects smile and Blink Detection, which warns the photographer if any subject’s eyes are closed during exposure. The Optio W60 features Digital Shake Reduction, which compensates for camera shake and subject blurring during still-image photography. This mode automatically adjusts sensitivity up to a maximum of ISO 6400 based on ambient lighting, which permits a faster shutter speed to capture sharp, clear images. In addition, Digital Shake Reduction for playback corrects blurring in images post-capture. This entry was posted in Digital Cameras, Pentax and tagged Pentax, Pentax Optio, Pentax Optio W60 on June 3, 2008 by jonathanb. The Pentax K20 (announced 23 January 2008) is a mid priced DSLR which is the successor to the popular K10D. It features a 14.6 megapixel CMOS sensor, live view (for framing images through the LCD), built in shake reduction, Custom image modes with 6 preset options, and an ISO range of up to 6400 (extended). It also features the high speed PRIME imaging engine with expanded dynamic range function. This entry was posted in Digital Cameras, Pentax and tagged Pentax, Pentax K Series on March 24, 2008 by jonathanb. 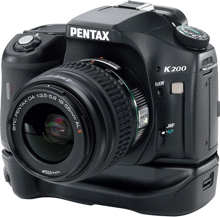 The Pentax K200D (announced 23 January 2008) is a 10 megapixel entry level DSLR which replaces the K100D. The K200D while being targeted to beginners has an impressive range of features such as a 2.7 inch LCD, CCD based image sensor, shake reduction, weather sealed body and dust reduction technology. The Pentax Optio S12 (announced 23 January 2008) is a 12 megapixel digital camera with a 3x optical zoom lens (28mm – 114mm equivalent). 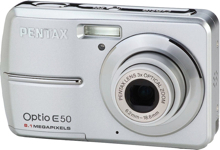 The Pentax Optio E50 (announced 23 January 2008) is an 8.1 megapixel point and shoot camera with a 2.4 inch LCD and 3x optical zoom lens (38mm – 113mm equivalent). The Pentax Optio V20 (announced 17 March, 2008) is an 8.0 megapixel ultra slim point and shoot camera with a 5x zoom lens (36mm – 180mm equivalent) and a 3.0 inch LCD monitor. The Optio V20 has innovative features such as Face Recognition, Smile Capture – to which detected facial expressions and releases the shutter, and Blink Detection – reporting when subjects close their eyes in an image. It also features, 52 megabytes of internal memory, auto tracking AF and Auto Macro mode and digital shake reduction. This entry was posted in Digital Cameras, Pentax and tagged Pentax, Pentax Optio on March 19, 2008 by jonathanb.